The following brief post is once again offered largely for the sake of interest, being concerned with the furthest limits of the distribution of early Byzantine material in Eurasia and Africa. 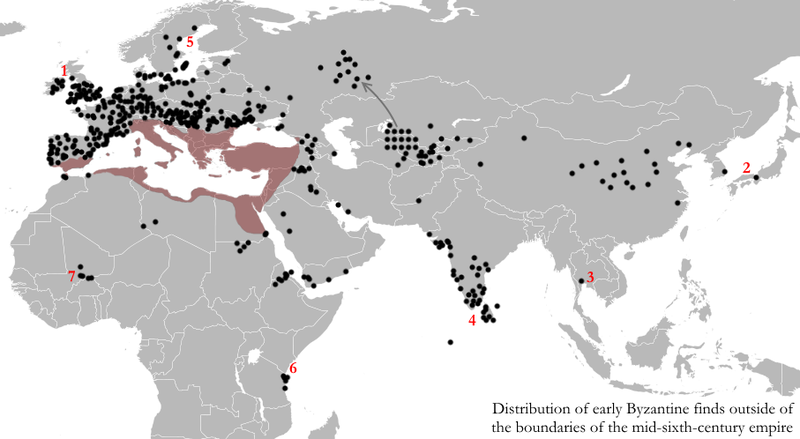 What follows consists of a distribution map of fifth- to seventh-century AD Byzantine finds and contemporary imitations accompanied by a brief discussion and illustration of some of the items that have been found in the far west, far east, far north and far south of the 'Old World'. Needless to say, the extensive distribution of early Byzantine material shown here is of interest for a number of reasons from the perspective of this blog, not least the light that it sheds on early medieval Britain's Byzantine and Indian Ocean imports and connections discussed in previous posts. For both St Jerome, writing near Bethlehem in 396, and Gildas, writing around a century later in late fifth- or early sixth-century Britain, the British Isles lay 'virtually at the end of the world towards the west and north-west'. 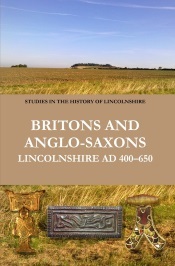 Despite this, there was clearly an intriguing degree of contact between the British Isles and the early Byzantine empire during the fifth to seventh centuries, as has been discussed at length in a previous post. 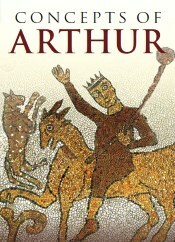 In terms of the material evidence for this connection, this is manifested by significant finds of fifth- to sixth-century Eastern Mediterranean and North African pottery in western Britain and Ireland (with around half of the total coming from the probable royal site of Tintagel, Cornwall), alongside Byzantine coins, metalwork, and a number of burials of people whose isotope results indicate that they could well have grown up in Byzantine North Africa. It has often been suggested that the material in the west may have arrived via a different mechanism to that in the east, perhaps representing direct, official contact via the Straits of Gibraltar and the Atlantic coast vs indirect transfer via merchants and elite exchange along the rivers of mainland Europe, although finds of late sixth- to early seventh-century Byzantine coins from the Anglo-Saxon royal site of Rendlesham, Suffolk, have recently been interpreted as evidence for 'direct mercantile contacts' with the Byzantine world in eastern Britain too. 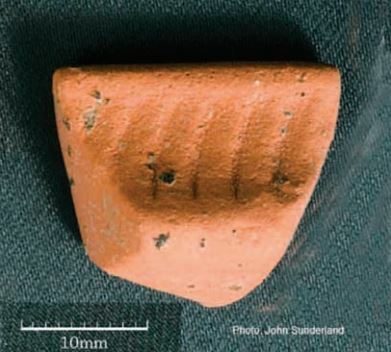 A rim-sherd of Phocaean Red Slip Ware—high quality red-slipped tableware made in modern Turkey during the late fifth to early sixth century—discovered at Collierstown, Co. Meath, Ireland (image: Kelly 2010, CC). Byzantine bowls and spoons (with Greek inscriptions) from the Eastern Mediterranean, made c. 600 AD and found in the early seventh-century Sutton Hoo ship burial, Suffolk (image: British Museum). The Wilton Cross, incorporating a Byzantine solidus of Heraclius dating 613–32; made at an East Anglian workshop in the first half of the seventh century and found at Wilton, Norfolk (image: British Museum). 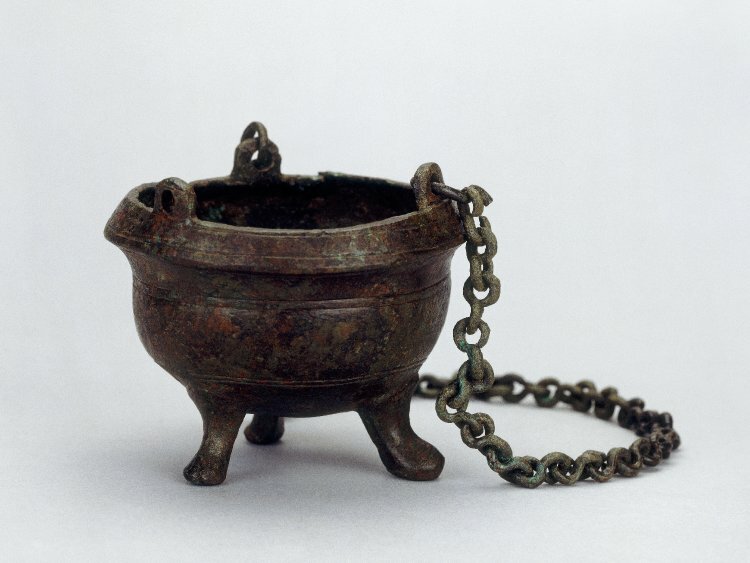 A sixth- to seventh-century early Byzantine censer, found at Glastonbury Abbey; it was found with traces of burnt incense still remaining within it and the closest parallels for the Glastonbury censer come from Sardis (Turkey), Egypt and Galilee (image: British Museum). 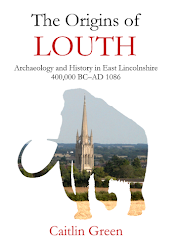 If there is a substantial amount of early Byzantine material found in Britain and Ireland, the apparent westernmost extremity of the known world in late antiquity, there is also a notable quantity at the far eastern end too. In St Jerome's letter, cited above, the rhetorical opposite extremity of the world to Britain was given as India, but Roman and Byzantine authors were certainly aware of the existence of China and parts of Southeast Asia. China was, for example, mentioned by Roman and early Byzantine writers from the first century BC onwards and it is included not only in Ptolemy's second-century AD Geography (which mentions parts of Southeast Asia too), but also on the Tabula Peutingeriana, a fascinating map that seems to have had its origins in the Late Roman period. Moreover, Roman and especially Chinese sources make several references to Hellenistic, Roman and early Byzantine entertainers, merchants and/or embassies being present in China and Southeast Asia, including a mission in 166 AD that arrived via the south coast—probably entering China via Vietnam and claiming to have been sent by the Roman emperor Andun (Antoninus Pius or Marcus Aurelius Antoninus? ), although this was perhaps really a commercial action that chose to represent itself this way—and numerous seventh- and eighth-century Byzantine embassies to Tang China. In addition to this material from the very far east, we also have a notable quantity of primarily sixth- to early seventh-century Byzantine gold coins and sixth- to eighth-century imitations from tombs in China, along with a number of finds of early Byzantine metalwork and glassware (and imitations of the same) from this country too. 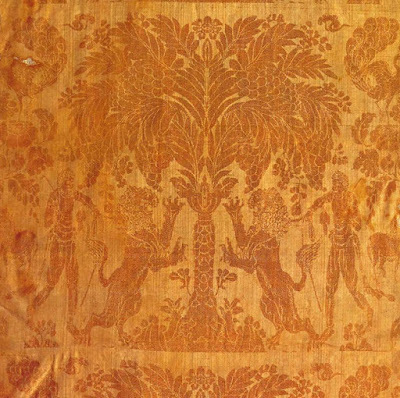 Both this material and that discussed in the preceding paragraph is often thought to have arrived via Central Asia along the 'Silk Road', especially given the presence of a number of similar finds in areas such as Uzbekistan and Tajikistan, although some of the Byzantine items found close to the Chinese coast and in Korea and Japan could have alternatively arrived by the less-discussed southern, maritime 'branch' of the Silk Road instead. Certainly, earlier Roman and Greek mariners made use of this route, and early Byzantine written sources moreover appear to make reference to it, whilst finds of fifth- to seventh-century Sasanian glassware in Japan are argued to have probably arrived there via the sea route. With regard to this maritime 'road', another relevant find may well be that of a probably sixth-century Byzantine lamp found in Thailand (marked as '3' on the map, above), and it is worth noting in this context that an East Javanese millefiori bead of sixth-century date has been found at the Byzantine Red Sea port of Berenike too (curiously, such beads are very rare indeed outside of East Java, with the only other concentration really being in the Silla tombs of Korea, mentioned above!). 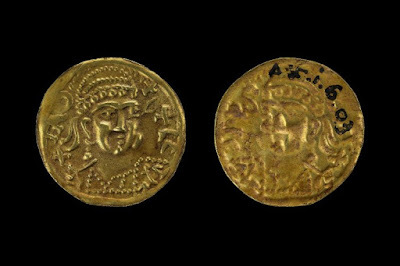 Finally, thousands of fifth- to seventh-century Byzantine gold and bronze coins and imitations are known from India and Sri Lanka ('4' on the map), accompanied by fifth- to sixth-century amphorae on coastal and inland sites in western India. Such finds support the textual evidence for continued Indo-Roman trade and/or interaction via the Red Sea beyond the more frequently discussed Early Roman era into the Late Roman/Early Byzantine period, as do both the Indo-Pacific imports found at sites such as Byzantine Berenike and the recent isotopic analysis of burials of the fourth- to fifth-century AD at the Byzantine Red Sea port of Aila (Jordan), which indicates that people from areas beyond western Asia and North Africa were living there then, including some who had potentially grown up in the Indus Valley. 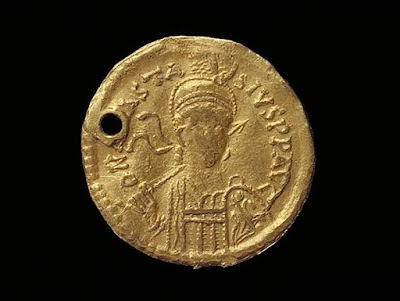 A gold imitation of a sixth-century Byzantine coin of Justinian I, struck on one side only, found in the Astana cemetery, China (image: British Museum). 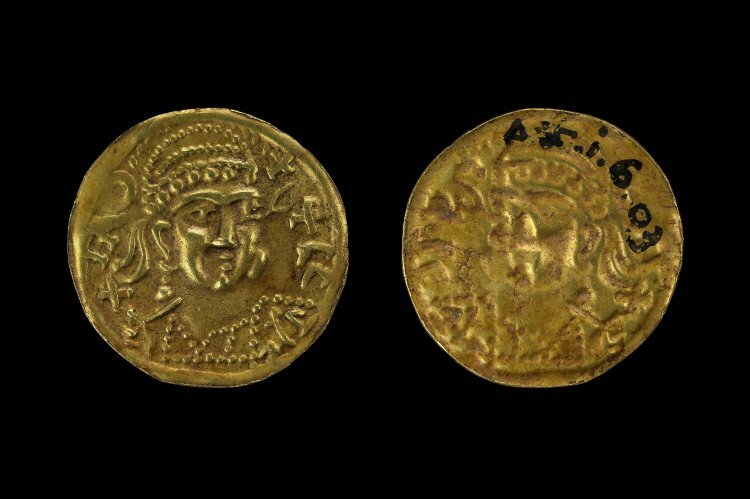 An example of a genuine Byzantine coin found in China is this mint gold Byzantine solidus of Anastasius (491–518), found in tomb of Emperor Jiemin (d. 532), Northern Wei dynasty. 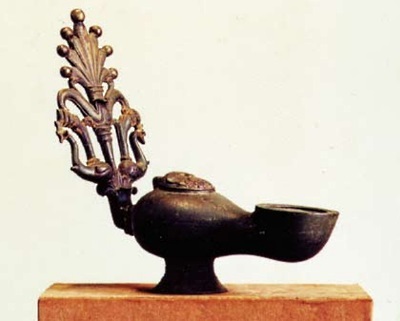 A probably sixth-century Byzantine bronze lamp from Egypt, found at Pong Tuk, Thailand (image: scalar.usc.edu). A copper-alloy coin of Justin II (565–78), found in southern India or Sri Lanka and collected by Colin Mackenzie in the early nineteenth century (image: British Museum). Turning to the extremity of the world that St Jerome termed 'the frozen zone of the North', there is once again a number of interesting finds dating from the early Byzantine period. The most northerly material mapped here comes from northern Sweden, where a number of sixth- to seventh-century bronze Byzantine coins have been found as part of a wider trend of Hellenistic to early Byzantine coin finds in this region. These have been most recently studied by Zachrisson, who argues that they may well have arrived contemporaneously as part of the trade in northern fur products between Scandinavia and the Mediterranean world, and that they represent a phenomenon distinct from that which carried significant quantities of fifth- to mid-sixth-century Byzantine gold solidi and other material to the Baltic coast, islands and southern Scandinavia. Looking east of the Baltic, there are other very northerly finds of early Byzantine material known from Estonia and Russia. The Estonian finds consist of two late fifth- to early sixth-century silver bowls discovered at Kriimani and Varnja in eastern Estonia; these are thought to be most probably direct imports from the south, rather than items that originally came to southern Scandinavia and were then transported eastwards, and can perhaps be once more associated with the fur trade or possibly the amber trade. The Russian finds come from the Kama region and consist of around two dozen pieces of early Byzantine silver plate, although in this case many of the finds come from features dating from the eighth to twelfth centuries AD, are found with Sasanian silver, and/or bear Sogdian, Chorasmian and other graffito. 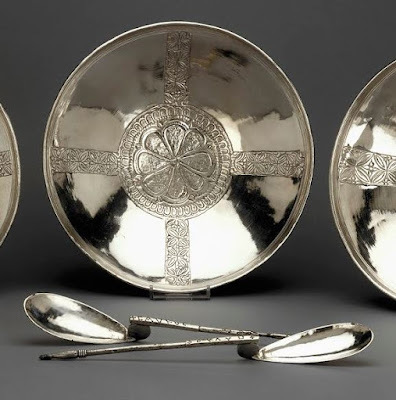 In light of this, it has been argued that these early Byzantine silver objects were originally transported to Central Asia before being subsequently re-exported to northern Russia. A gold solidus of the Byzantine emperor Anastasius (491–518) found on the Swedish island of Öland; pierced for suspension (image: SHM, CC BY 2.5 SE). 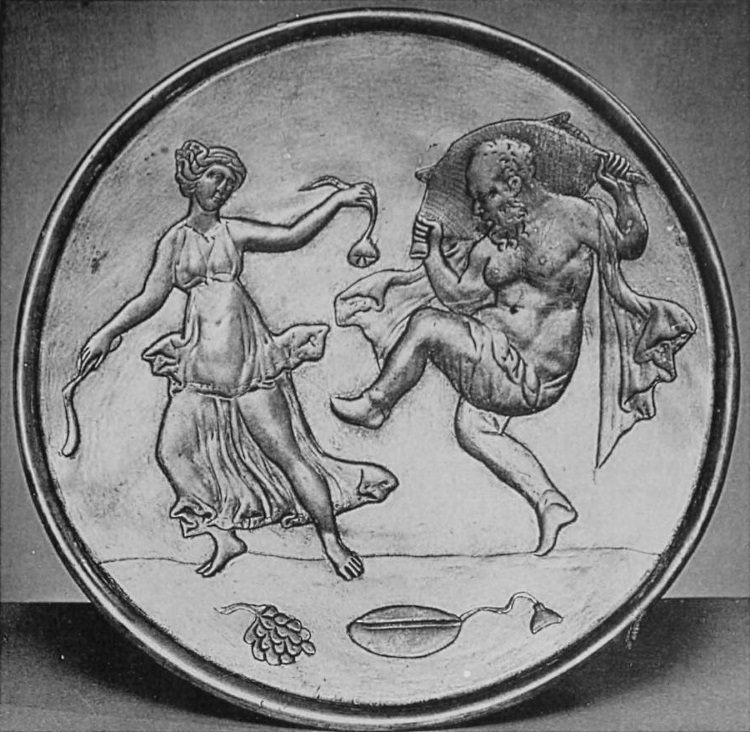 An early seventh-century Byzantine silver gilded dish with Silenus and a Maenad; made in Constantinople, 613–629/30, with seals from the reign of Heraclius on the rear, and found in 1878 near Solikamsk, Perm, Russia (image: Internet Archive, Public Domain; a copyrighted colour photograph of this dish is available here). Looking finally to the lands of 'burning heat' to the far south of the early Byzantine empire, there are yet more intriguing finds to note. 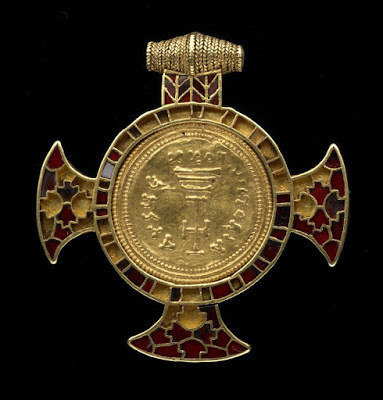 The first find is located almost on the Equator and comes from the middle of the Indian Ocean on the island of Gan, the largest island of the Maldives, where a cache of fifth- to sixth-century Byzantine gold coins were discovered in 1986 as part of investigations into a sixth-century and later Buddhist monastery located there. Needless to say, this stupa hoard should be almost certainly considered alongside the southern Indian and Sri Lankan finds discussed above. With regard to the Maldives, it is incidentally worth noting that there are references to people from these islands within the Roman empire in the fourth century AD from Ammianus Marcellinus and Philostorgios, and a passing mention seems to be made by Cosmas Indicopleustes in the sixth century, whilst Tang dynasty documents record two visits of Maldivians to China in the seventh century. Even more southerly are the finds of early Byzantine materials made along the East African coast of Tanzania, well within the southern hemisphere (marked as '6' on the map). 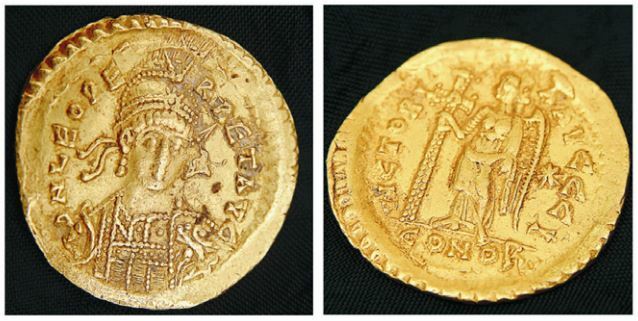 The earliest recorded finds from here are Byzantine coins of Justin I (518–27), Justinian I (527–65) and Heraclius (610–41) found on Pemba Island, part of the Zanzibar Archipelago, and the main coast opposite at Tanga. Although these coins have been subject of some scepticism, recent archaeological work on the Tanga coast offers a degree of support, indicating that there was probably long-distance trading taking place here in the pre-Islamic period and noting that this area is likely to be the location of the trading centre known to Graeco-Romans as Toniki. Even more significantly, excavations on Zanzibar island at the Unguja Ukuu site, just to the south of the Tanga coast, have revealed the presence of two pieces of early Byzantine fine ware pottery made in fifth- to early sixth-century Egypt and some probable early Byzantine glass from a level radiocarbon dated to c. 500 AD, whilst the north coast of Zanzibar has seen a find of fifth-century Byzantine amphorae sherds from the Fukuchani site. Moreover, further relevant finds been made a little way down the East African coast, close to the probable location of the southernmost 'metropolis' and trading port known to the Romans, Rhapta (mentioned by the Periplus and Ptolemy, and reportedly located in 2016 by divers off Mafia Island, Tanzania, who found the remains of five to six metre high walls associated with Roman-style ceramics and tile), including pieces of glassware that are comparable to examples from Fayum, Egypt, and were apparently made in sixth-century Syria, these having been recovered from a site at Kivinja that is radiocarbon dated to the fifth to sixth centuries AD. Turning lastly to West Africa, recent work has again revealed evidence for the presence of probable early Byzantine material and contemporary imitations in the Sahara itself and also in parts of Sub-Saharan West Africa. The finds from within the Sahara are associated with the Garamantes, who made use of elaborate underground irrigation systems known as foggara in the Fezzan area of Libya in order to create a prosperous civilisation in the Sahara desert, including several small planned towns with a capital, Garama, that at its peak was home to around 4,000 people with a further 6,000 in surrounding satellite villages. 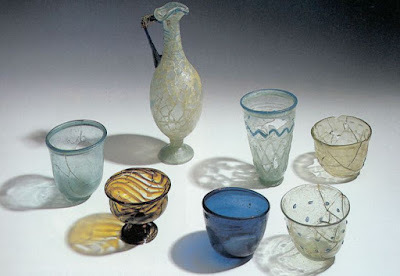 Early Byzantine items recovered from here include fourth- to fifth-century AD glass vessels from the the heartland of the Garamantian kingdom—the Saharan oasis belt of the Wadi al-Ajal—which were made out of Egyptian HIMT glass, and part of a late sixth- or early seventh-century North African amphora recovered from the Garamantian fortified village of Aghram Nadharif in south-western Libya (a comparable example was excavated from early Byzantine Leptis Magna). Beyond the Sahara in Burkina Faso and Mali (marked as '7' on the map) there are yet more relevant items which presumably arrived in Sub-Saharan West Africa via the Garamantian kingdom. These include cowrie shells dated to the fifth to seventh century (which must have come from the Red Sea or further afield), carnelian and glass beads imported from both early Byzantine Egypt/the Levant and the Sasanian Middle East, and copper-alloy items of the fifth to seventh centuries made from metal that was imported from the Eastern Mediterranean and Britain, all recovered from a fourth- to seventh-century cemetery site at Kissi, Burkina Faso. 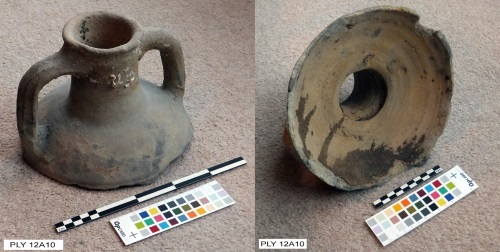 Likewise, there have been finds of amphorae rims which seem to be imitative of North African amphorae of Late Roman/early Byzantine date (up to the seventh century) from three sites in Mali, to the west of Kissi, one from a context dated c. 450–600 AD. 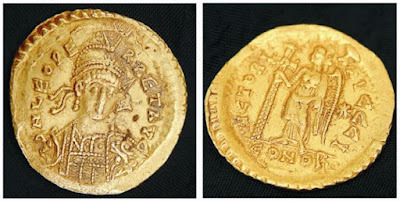 A gold coin of the emperor Leo I (d. 474) found on Gan, the largest island of the Maldives; this is one of several fifth- to sixth-century Byzantine coins found in a container buried on a monastic site believed to have been established in the sixth century AD (image: NCLHR, reportedly Public Domain). 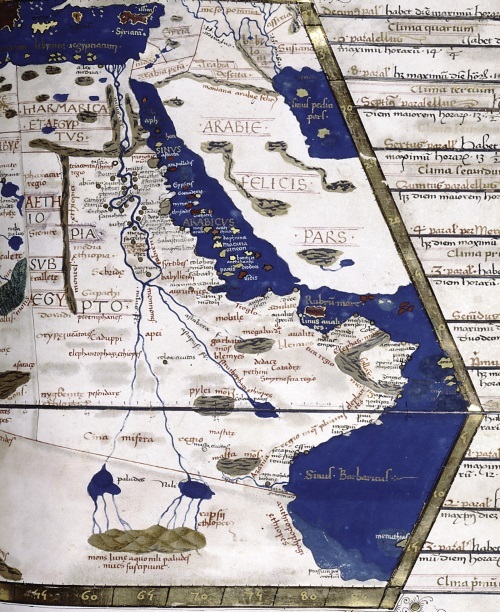 Ptolemy's map of East Africa from a fifteenth-century copy, with the 'metropolis' of Rhapta marked along with other trading sites along the east coast down to Tanzania that were known to the Romans (image: Wikimedia Commons). 1. The map included here is based on M. M. Mango (ed. ), Byzantine Trade, 4th-12th Centuries: The Archaeology of Local, Regional and International Trade (Farnham, 2009), figs. 1.1 and 15.4, with a significant number of modifications and additions. 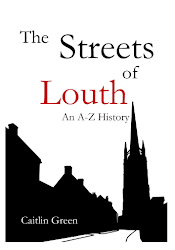 Sources utilised include the following: K. C. MacDonald, 'A view from the South: sub-Saharan evidence for contacts between North Africa, Mauritania and the Niger, 1000 BC–AD 700', in A. Dowler & E. R. Galvin, Money, Trade and Trade Routes in Pre-Islamic North Africa (London, 2011), pp. 72–82; S. Magnavita, 'Initial encounters: seeking traces of ancient trade connections between West Africa and the wider world', Afriques, 4 (2013), online at https://afriques.revues.org/1145; S. Magnavita, 'Sahelian crossroads: some aspects on the Iron Age sites of Kissi, Burkina Faso', in S. Magnavita et al (eds. ), Crossroads / Carrefour Sahel: Cultural and Technological Developments in First Millennium BC/AD West Africa (Frankfurt, 2009), pp. 79–104; T. R. Fenn et al, 'Contacts between West Africa and Roman North Africa: archaeometallurgical results from Kissi, northeastern Burkina Faso', in S. Magnavita et al (eds. ), Crossroads / Carrefour Sahel, pp. 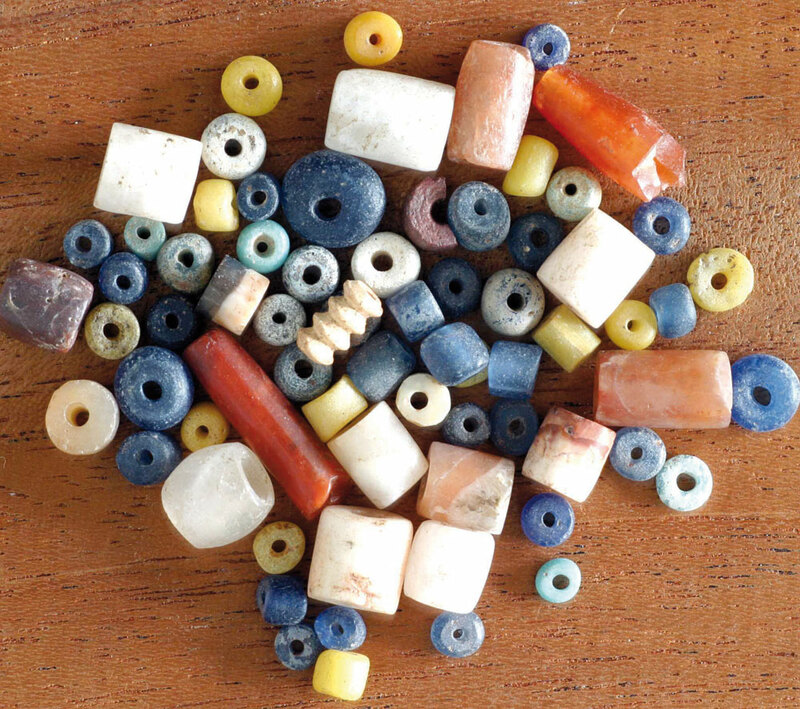 119–46; C. N. Duckworth, 'From the Mediterranean to the Libyan Sahara: chemical analyses of Garamantian glass', Journal of Archaeological Science: Reports, 7 (2015), 633–9 at p. 635; M. Liverani (ed. 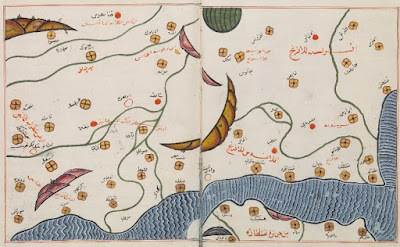 ), Aghram Nadharif: the Barkat Oasis (Sha'abiya of Ghat, Libyan Sahara) in Garamantian Times. The Archaeology of Libyan Sahara, Volume II (Firenze, 2005), pp. 242, 248, 368 ; R. R. Darley, Indo-Byzantine Exchange, 4th to 7th Centuries: a Global History (University of Birmingham PhD Thesis, 2013); N. Mohamed, 'Maldivian seafaring in the pre-Portuguese period', National Centre for Linguistic and Historical Research, Republic of Maldives (2005), online at http://qaumiyyath.gov.mv/docs/whitepapers/history/seafaring.pdf; S. Moorhead, 'Early Byzantine copper coins found in Britain – a review in light of new finds recorded with the Portable Antiquities Scheme', in O. Tekin (ed. ), Ancient History, Numismatics and Epigraphy in the Mediterranean World (Istanbul, 2009), pp. 263–74; A. I. Zachrisson, 'Vittnesbörd om pälshandel? Ett arkeologiskt perspektiv på romerska bronsmynt funna i norra Sverige', Fornvännen, 105 (2010), 187–202; R. Hobbs, Late Roman Precious Metal Deposits, c. AD 200-700: Changes Over Time and Space (University of London PhD Thesis, 1997); P. Somogyi, 'New remarks on the flow of Byzantine coins in Avaria and Walachia during the second half of the seventh century', in F. Curta & R. Kovalev (eds. ), The Other Europe in the Middle Ages: Avars, Bulgars, Khazars and Cumans (Leiden, 2008), pp. 83–149; F. Curta & A. Gândilă, 'Hoards and hoarding patterns in the Early Byzantine Balkans', Dumbarton Oaks Papers, 65–66 (2011–2012), 45–111; E. Stolyarik, Essays on Monetary Circulation in the North Western Black Sea Region in the Late Roman and Byzantine Periods (Odessa, 1993); H. Horsnaes, 'Late Roman and Byzantine coins found in Denmark', in M. Wołoszyn (ed. ), Byzantine Coins in Central Europe between the 5th and the 10th century (Krakow, 2009), pp. 231–70; M. Woloszyn, 'Byzantine coins from the 6th and the 7th c. from Poland and their East–Central European context. Ways and phases, context and function', in A. Bursche et al (eds. ), Roman Coins outside the Empire. Ways and Phases, Context and Function (Wetteren, 2008), pp. 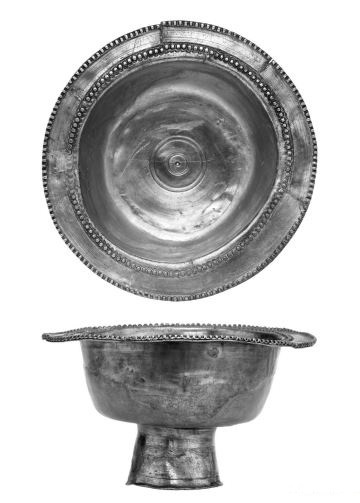 195–224; D. Quast & U. Tamla, 'Two fifth century AD Byzantine silver bowls from Estonia', Estonian Journal of Archaeology, 14 (2010), 99–122; A. Naymark, Sogdiana, its Christians and Byzantium: a Study of Artistic and Cultural Connections in Late Antiquity and Early Middle Ages (Indiana University PhD Thesis, 2001); R. Hobbs, 'Roman coins from Merv, Turkmenistan', Oxford Journal of Archaeology, 14 (1995), 97–102; Lin Ying, 'Solidi in China and monetary culture along the Silk Road', The Silk Road, 3.2 (2005), 16–20; J. Drauschke, '"Byzantine" and "oriental" imports in the Merovingian Empire from the second half of the fifth to the beginning of the eighth century', in A. Harris (ed. ), Incipient Globalisation? Long-Distance Contacts in the Sixth Century (Oxford, 2007), pp. 53–73; P. Bartlett et al, 'The Byzantine gold coinage of Spania (Justinian I to Heraclius)', Revue Numismatique, 6 (2011), 351–401; B. Ager, 'Byzantine influences on Visigothic jewellery', in C. Entwistle and N. Adams (eds. ), Intelligible Beauty: Recent Research on Byzantine Jewellery (London, 2010), pp. 72–82; B. M. Serrano, 'Old and new coins in Southern Hispania in the 6th century AD', in J. Chameroy & P-M. Guihard, Produktion und Recyceln von Münzen in der Spätantike (Mainz, 2016), pp. 139–53; C. Morrisson, 'Regio dives in omnibus bonis ornata: the African economy from the Vandals to the Arab conquest in the light of coin evidence', in S. T. Stevens & J. P. Conant (eds. ), North Africa under Byzantium and Early Islam (Washington, D.C., 2016), pp. 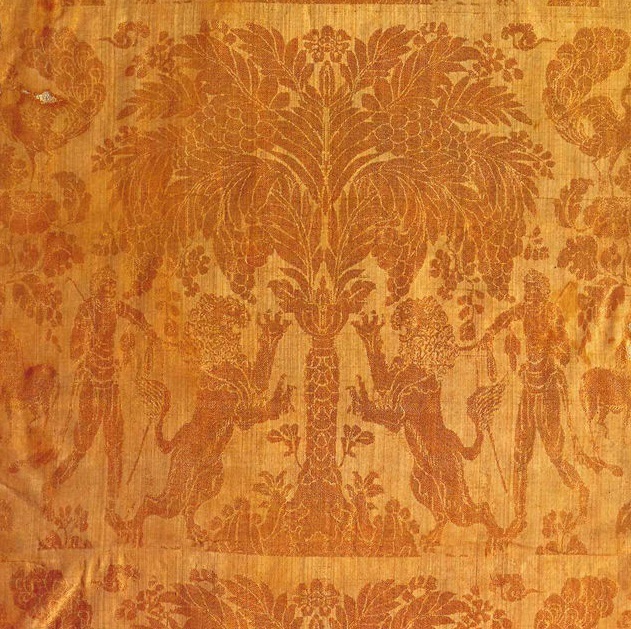 173–98; C. Kwangshik, 'Silla Art and the Silk Road', International Journal of Korean History, 19 (2014), 1–22; S. Lee & D. P. Leidy, Silla: Korea's Golden Kingdom (New York, 2013); B. Borrell, 'The early Byzantine lamp from Pong Tuk', Journal of the Siam Society, 96 (2008), 1–26; H. Feltham, 'Lions, silks and silver: the influence of Sasanian Persia', Sino-Platonic Papers, 206 (2010), 1–51; N. Chittick, 'Six early coins from near Tanga', Azania, 1 (1966), 156–7; C. Ntandu, 'The find of ancient trade materials on the northern coast of Tanzania', online at academia.edu; N. Boivin et al, 'East Africa and Madagascar in the Indian Ocean world', Journal of World Prehistory, 26 (2013), 213–81; A. M. Juma, 'The Swahili and the Mediterranean worlds: pottery of the late Roman period from Zanzibar', Antiquity, 70 (1996), 148–54; A. Juma, Unguja Ukuu on Zanzibar: an Archaeological Study of Early Urbanism (Uppsala, 2004); F. A. Chami, 'The Early Iron Age on Mafia Island and its relationship with the mainland', Azania, 34 (1999), 1–10; D. T. Potts, 'The circulation of foreign coins within Arabia and Arabian coins outside the Peninsula in the pre-Islamic era', in M. Huth and P. G. van Alfen (eds. ), Coinage of the Caravan Kingdoms (New York, 2010), 65–82; T. Power, The Red Sea from Byzantium to the Caliphate: AD 500–1000 (Oxford, 2012); G. Duby, Map of 'L'empire byzantin à l'avènement de Justinien I (527 EC) et à sa mort (565 EC)', Grand Atlas Historique (Larousse, 1995–2004), available on Wikimedia Commons, with slight modifications. 2. T. L. Prowse et al, 'Stable isotope and mitochondrial DNA evidence for geographic origins on a Roman estate at Vagnari (Italy)', in H. Eckardt (ed. ), Roman Diasporas: Arachaeological Approaches to Mobility and Diversity in the Roman Empire (Portsmouth RI, 2010), pp. 175–97 at pp. 186, 189, 191, quotation at pp. 189–91; T. L. Prowse, 'Isotopes and mobility in the ancient Roman world', in L. de Ligt & L. E. Tacoma (eds. ), Migration and Mobility in the Early Roman Empire (Leiden, 2016), pp. 205–34 at p. 194.